Awesome Quotes: People you can connect with. People you can connect with. It’s easy to feel uncared for when people aren’t able to communicate and connect with you in the way you need. And it’s so hard not to internalize that silence as a reflection on your worth. But the truth is that the way other people operate is not about you. Most people are so caught up in their own responsibilities, struggles, and anxiety that the thought of asking someone else how they’re doing doesn’t even cross their mind. They aren’t inherently bad or uncaring — they’re just busy and self-focused. And that’s okay. It’s not evidence of some fundamental failing on your part. It doesn’t make you unlovable or invisible. It just means that those people aren’t very good at looking beyond their own world. But the fact that you are — that despite the darkness you feel, you have the ability to share your love and light with others — is a strength. Your work isn’t to change who you are; it’s to find people who are able to give you the connection you need. Because despite what you feel, you are not too much. You are not too sensitive or too needy. You are thoughtful and empathetic. 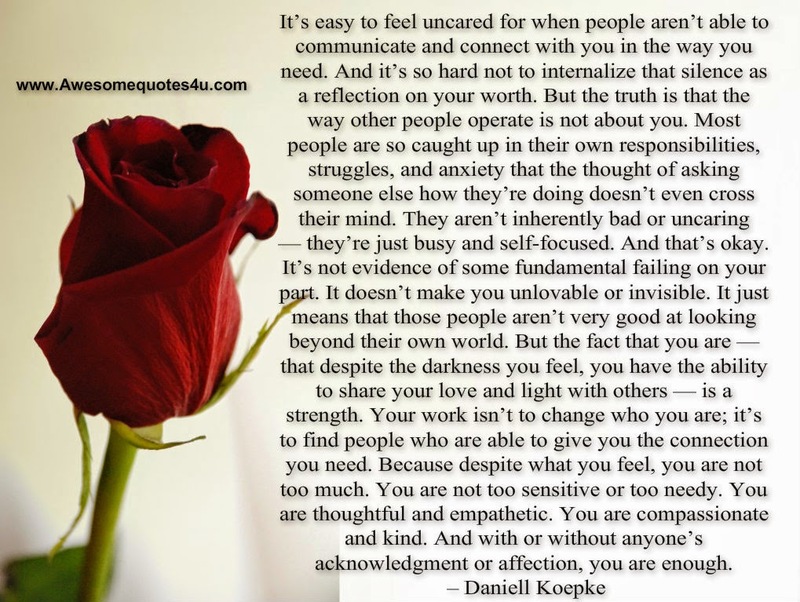 You are compassionate and kind. And with or without anyone’s acknowledgment or affection, you are enough.